The Most Ergonomic Electric Guitar Ever? Browse: Home / Electric Guitar / The Most Ergonomic Electric Guitar Ever? Little Guitar Works luthier Jerome Little has been busy – busy bringing his remarkable Torzal Natural Twist Neck to the Klein electric guitar! It’s an exciting combination that brings Jerome’s Repetitive Stress Injury (RSI) fighting neck design to the Klein’s already excellent ergonomic design. For those unfamiliar with the Torzal neck concept, it’s actually quite simple. By angling the neck downward at the nut, the degree of wrist flexion in the fretting hand is reduced thus resulting in a healthier, more neutral position for the wrist. Check out this Bass Guitar Magazine video review for more on the benefits of the design. We’ve seen Jerome’s work several times before including his custom bass guitar for Xavier Padilla but this is the first time I’ve seen his innovative neck applied to an electric guitar. I had never taken apart a Klein electric before, and I was interested to find that the neck pocket had a 5 degree angle on all three sides. Once I got the neck to fit perfectly (actually better than the original), it was obvious how that bevel serves to really lock the neck in place. The specifications of the neck include 14 degrees of twist – from 0 at the bridge to -14 at its zero fret. Stainless steel frets were used at the request of the owner but all other dimensions were duplicated from the original Klein neck. Granted, the Torzal Twist neck may not be for everyone. If you’re still craning your neck to watch your fretting hand, then having the neck twist away at the nut may make it harder to see what you’re doing. But for the experienced musician suffering from RSI or the guitarist seeking to practice prevention, Little Guitar Works may just have the answer for you. 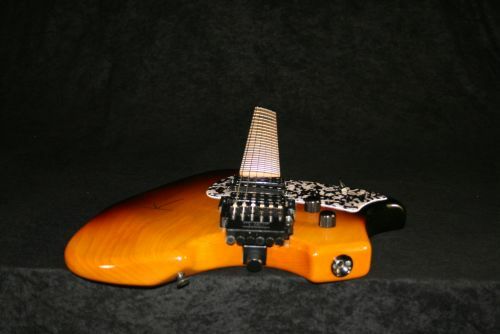 Learn Guitar » The Most Ergonomic Electric Guitar Ever? The Lace Helix guitars had a similarly twisted neck, however, the Lace website doesn’t currently have anything about those necks. The “Helix” name is now being used for a line of basses. I’m sure there’s a story there somewhere… ??? 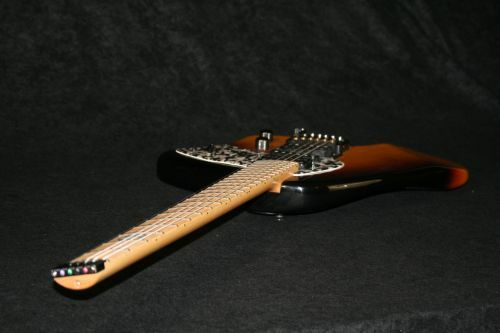 You’re absolutely right about the Lace guitars and I previously covered the Lace Cybercaster Electric Guitar – a model with a similar twisted neck. Of course the beauty of this particular guitar is the match up of the Torzal and the Klein. And there’s definitely a story there but I haven’t been able to get it. All I know is that they stopped making them some time ago. I’ve contacted Lace Music several times inquiring about the line to no avail. If anyone has any leads, please contact me. The guitars can still be found on places like ebay and there was even word that Lace had made some aftermarket necks. Unfortunately, I’ve yet to track a neck down and the few available guitars with the twist neck have been a bit too pricey to strip for parts. I think that this one lives up to its name. Awesome! I’m one of those “crane the neck” guys when it comes to soloing (chords not as much), but I still think I’d like to try one of those necks. Not that I’m in the market (or can afford it), but it’s implied that Little Guitar Works is offering this Klein-type for sale..? Is that the case? Probably won’t take long to find interested buyers given the demand for Kleins. Little Guitar Works made the neck specifically for a customer’s Klein guitar so its more of an “aftermarket” type of thing. He’s not making Klein shaped guitars. I’ll make sure to clarify that point in the article. Thanks! This is my first visit here and I want to tell you as a fellow musician, you have a great blog. I am a bass player myself and never really looked into any ergonomic guitars before. You blog struck me with interest. Myself, I only play fender basses, owning both a J and P bass, I prefer my J bass over my P bass. Thanks and I’m glad you’re enjoying the blog! Interesting guitar,I like these headless necks, they look nice. About the body…hmm, not my taste. Since nothing looks like it, the Klein tends to be an acquired taste. Sit down and play one and I think you’ll see the appeal of a shape that doesn’t require you to contort yourself to play it with comfort and ease. The thing is, it breaks ‘symmetry’ in a very practical way. And, in a post-modern sense, it is symmetrical. I’m definitely goin that way, if I can ever afford it. Hmmm, I’ve just wondered with all these necks. How the [explicit deleted] can you tell when it needs to have a (or any?) truss rod change? Are there any truss rods at all? I mean, people changes strings, and action and, due to humidity changes it warps. Eventually it will. It must be a major chore to find out if any fret is on it’s way out, or that is has too much relief or too little relief. How can one tell if the neck is “straight” or not? By looking down on it to see the “railroad!? Now, if a regular Klein neck, which has no truss rod, starts to warp, or the frets wear out, one can always sand it and level the frets quite easily provided you got the right tools. Bet that one is a major chore on these necks. I wonder how one can measure or see the level of each frets, and if they wear, how do one remedy this. The relief can be checked easily, in much the same way as a regular neck. First of all, sighting down the neck to see the “railroad” is a good place to start, to get an overall idea of what’s going on. Just remember to look at it and think about it more on a string-by-string basis, rather than across the board. The easiest way to really measure the relief is to fret a string at the 1st fret and at the 12th fret and check the distance between the string and the 7th fret. You can also hold a straight edge along each string path to check that way. All of my Torzal necks do have truss rods, and they function just the same as a regular neck. A lot of my customers do get nervous at first about making adjustments, and I encourage them to go for it–it’s all a part of getting to know your instrument. And they all report back that I was right, it’s really no big deal. There is a little bit of technique involved with leveling the frets, but it’s not a major chore. Instead of a flat file or sanding block, I use a precision ground steel rod stuck with sandpaper. I move the rod diagonally across the board, keeping it in the string path as I go. As with a regular neck, you can see after a couple of strokes which frets are high or low. Any competent luthier could do this job, but I do also offer free lifetime fretwork to all of my original customers. Is there any kind of Radii, or radius on these necks too? Like compound radius or something else. Or is it complete straight? Then together with the torzal, it must be even worse to calculate everything. If the radius is gradually increasing or decreasing as the torzal neck turns the other way.